There are many great chapters in the Bible that either tell a story or give great comfort and encouragement. Here are 10 chapters from the Bible that are inspirational in their own way. I trust they will be as much of an encouragement to you as they are to me. The story of David and Goliath is an inspiring one. This chapter starts off with the Israelites engaged in battle with their enemy, the Philistines. David’s father sends the young shepherd boy to the battlefield, not to fight, but to carry supplies to his brothers. When he arrives he hears the enemy of God’s people denouncing God. David can’t stand to sit idly by as the Israelites are humiliated. Taking only a sling and 5 small stones, David does battle with the giant named Goliath. This short Psalm is an inspiration to us in knowing that our kind Shepherd is always present with us. He leads us where He wants us to go. He nourishes us. He protects us. He is preparing the way before us. Often read when people have suffered a great loss in their lives, Psalm 23 is a chapter of comfort. But reading it does not need to be limited to only times of loss. 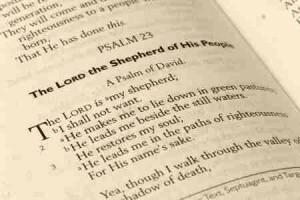 This short Psalm is an inspiration to us in knowing that our kind Shepherd is always present with us. He leads us where He wants us to go. He nourishes us. He protects us. He is preparing the way before us. What a wonderful set of promises packed into 6 short verses. This Psalm has the distinction of being the longest chapter in the Bible. But don’t skip over it when reading God’s Word because of its length. Take time to enjoy it. The Psalm directly mentions God’s Word in some form in every verse except one. Can you find it? The great vision of Isaiah. He saw the Lord on His throne, high and lifted up. Isaiah realized his own uncleanness. He felt unworthy to serve the Lord. Don’t we all feel that way at times? We should. Yet, God did not destroy Isaiah for his humanity. God purified the prophet (as He does with us at salvation) and called Isaiah to do a work for Him. A wonderful promise of a remnant of God’s conquering people is given at the end of the chapter. The indwelling of the believers by the Holy Spirit in Acts chapter 2 has to be one of the most inspirational chapters in the Bible. The Christians were gathered together praying and learning from God’s Word. The disciples stood to preach and teach before the multicultural and multilingual crowd. Each person heard the teaching in their own language. Peter laid out a clear presentation of the Gospel for the crowd that was present. Many were saved and added to the church on that great and glorious day. Who or what can “separate us from the love of Christ?” The answer given in Romans 8 is, of course, no one nor nothing. What a wonderful promise! They that are in Christ have no condemnation, neither in this life nor the next. That does not mean we won’t have problems in this world, but that our eternal souls are secure in Christ and that He is watching over us and caring for us even when we don’t see His presence. This chapter is often called the “Love Chapter.” We are instructed as to how love should be displayed and why it is considered by Paul to be the greatest of all spiritual gifts. Regardless of what other strengths the Lord has given you through the Holy Spirit, they should be exercised with love. Paul says that none of the other gifts covered in chapter 12 have any value if they are not also accompanied with a genuine love that we can have through the Spirit of God. A complete seminary course in Soteriology (the doctrine of salvation) could be taught on just the 15th chapter of 1 Corinthians. A simple explanation of the Gospel is given in the first few verses and then the results of what that means for our eternity are clearly laid out in the rest of the chapter. Don’t miss that the whole point of the death, burial and resurrection of our Lord was because of our sins. If you have not come to the place of seeing your own personal need for salvation from your sins, then you have not come to a full understanding of the Gospel of the Bible. Really we should include chapter 5 with this one since chapter 6 is a continuation. These two chapters talk about our relationships with one another, both inside and outside of our own family units. Then the whole thing is capped off with those wonderful verses about the armor of God. This chapter is an inspirational challenge to treat those around us in a godly way while being given all the necessary tools to accomplish that task. We all love reading inspirational stories. Hebrews 11 is a chapter that summarizes many great stories from the past. Some stories are given with great detail while others are briefly mentioned. It is a wonderful Bible study to go back into the previous books of the Bible to read about the different people mentioned in Hebrews 11. The many stories mentioned in Hebrews 11 makes this a great chapter to end our look at these 10 inspirational chapters of the Bible. Take time to read these chapters and study them in greater depth. You will be challenged and inspired to do a work for the Lord. What chapter in the Bible would you like to add to this list? Please let us know in the Comments. Ps 119:132 might also qualify, but it does mention God’s “Name”, which is synonymous with His “Word” made flesh. I’ll like you to add Psalm 91, which assures us about God’s divine protection at all times and in every situation for His children. thanks… I was looking for an article just like this! Also Hebrews 13 (and basically all of Hebrews) is a great and uplifting chapter. It talks about how we need to love each other, and I especially like Verse 8: “Jesus Christ is the same yesterday and today and forever.” God never changes: he is our constant! If you don’t know Hebrews 13 well I would strongly encourage you to read it. 🙂 Our God is Amazing! Jeremiah 29:11 i alone know the plans i have for you,,,,God indeed is in control of every finer detail of your life.! I will be loving hopeful to read through here and love another! Also I want to add the following Chapters.